Imagine this: you have a beautiful, newly renovated kitchen. Bright, clean and classic. State-of-the-art appliances. Yes, that’s correct. A brand new kitchen with no doors on any cabinet. 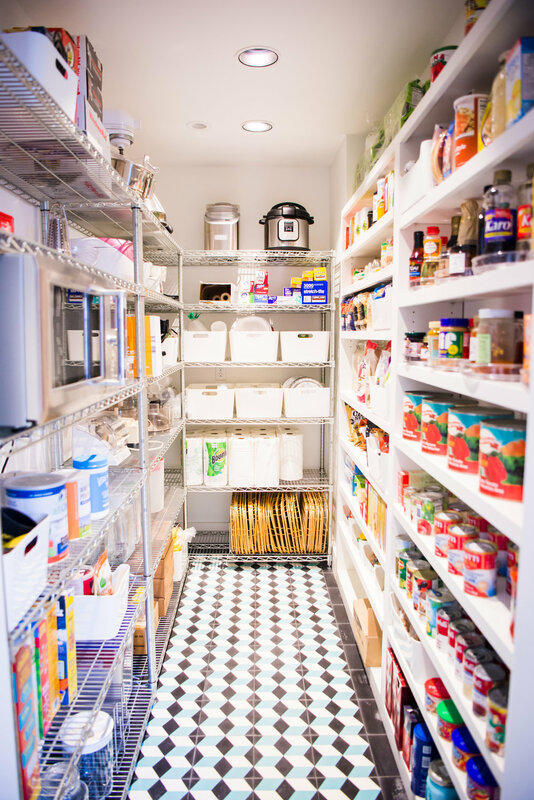 This was the situation our recent clients found themselves in when they reached out to us about organizing and decluttering their kitchen and pantry. Not only did they not have any kitchen cabinet doors, but they had lived so long without the doors that all of their kitchen items were spread out on every available space. Everywhere we looked there was stuff layered and stacked. Their beautiful, new kitchen was hidden. By stuff. For this job, we couldn’t get rid of anything. Not one thing. 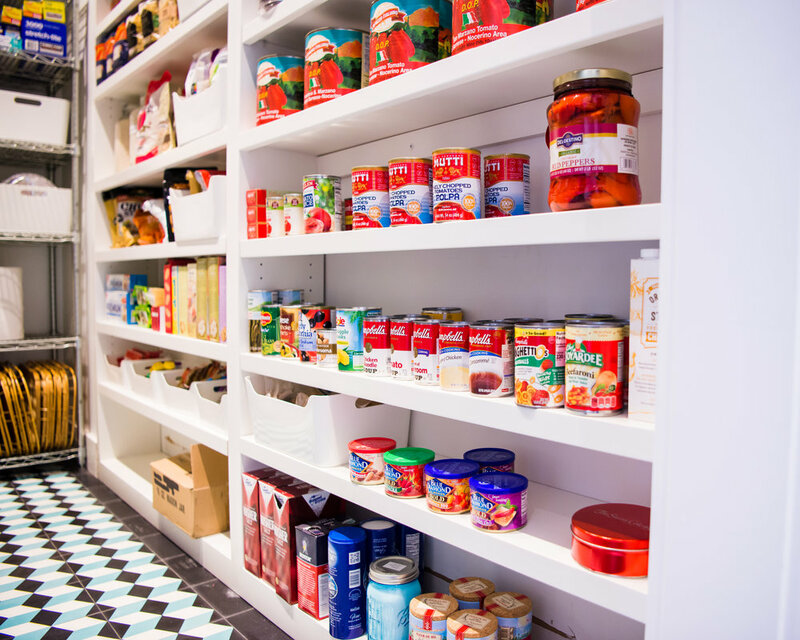 Our clients didn’t want to part with any items nor food, but they did need the right organizational systems in place to be able to use their kitchen again. It took us some time to wrap our heads around this added twist; and while it felt a bit daunting at first, Katie and I love a good challenge and we knew we could handle it! Our clients for this project are a sweet couple living here in Memphis. He is an accomplished cook, owning nearly every cooking and baking utensil one could imagine. I’m not exaggerating when I tell you there were forty pans alone. Just before we started the project, the couple was able to find another cabinet maker to install the doors and we got to work. We wanted to find accessible ways to organize the kitchen and still keep everything in the space. Katie and I also wanted to highlight the beautiful new features of the kitchen and pantry. We knew we could create a functional, efficient center for their home in which they would enjoy cooking and entertaining guests once again. To begin on a project of this magnitude, we relied a great deal on separating out all items and building piles. Taking everything out of the shelves and off the counters and grouping pieces by category allowed us to estimate just how much space we needed and which pieces needed to be housed together. Tip: Spreading all of your items out in one space will allow you to efficiently judge what to keep and what to toss. It will also allow you to know just how many of each item you own. Seeing it all in one space will amaze you. But remember, we couldn’t get rid of anything for this project. Katie and I carefully planned which area in the kitchen and pantry would hold which items. We grouped like items in sections in designated spots. We also utilized space very well. The key to doing this? Tip: Whatever you can file vertically? Do it. This trick is a tremendous space saver and allows people to see everything without having to move and adjust other pieces. While the biggest challenge of this project was the sheer amount of items needed to be placed in the kitchen and pantry. We also wanted to keep in mind that since our client loves to cook, he needs to be able to find all of his materials easily. Vertical organization saved us in this instance. We can proudly say that our client can now reach any of those pans. No stacking and balancing. No adjusting and shifting. Just clean organization! By the end of the project, our clients were thrilled with their new, efficient systems. They loved that they didn’t have to sacrifice any of their kitchen items or food in order to accommodate these new systems. Their gratitude at finally celebrating their newly renovated kitchen was palpable. Our clients not only love cooking, but they are artists with a deep history and appreciation of photography and art. We were so moved when our client said to us, “Your work is a form of art.” We cherish those words and so appreciated her perspective about our craft. This does feel like an art form when you’re creating and building. It was remarkable that because of her words and vantage point, we were able to step back and see it for exactly that. P.S. More of our organization tips for kitchens.